UTM's Pierre Desrochers and Joanna Szurmak see it another way. In a new book, Desrochers, an associate professor of geography, and Szurmak, a research services librarian, caution that "population alarmism" and campaigns against carbon will stifle development, innovation and the creativity necessary to solve global problems. Titled Population Bombed! Exploding the Link Between Overpopulation and Climate Change, the book's publication comes 50 years after The Population Bomb, by Stanford University biology professor Paul Ehrlich, caused a sensation by predicting imminent environmental collapse followed by mass starvation. Debunking Ehrlich's theory started as a policy paper that the two were commissioned to write by a UK think-tank, timed to coincide with that book's 50th anniversary. Desrochers, who specializes in energy and food policy, expanded the paper into a book along with Szurmak, who is writing a dissertation on human creativity as a doctoral candidate in science and technology studies at York University. Desrochers and Szurmak write in their book that the predictions of doomsters have not been borne out by reality, and this is not the time to listen to them. Desrochers notes that "population-growth catastrophism" dates back thousands of years, although it is now mostly associated with the British economist Thomas Malthus, who wrote a book in 1798 warning that population growth would outrun the food supply. The most successful proponent of this theory in more recent times was Ehrlich, a charismatic speaker who fired up a generation of activists in 1968 with the best-selling The Population Bomb. Indeed, Desrochers says that Ehrlich was such a cause célèbre that he appeared more than 20 times on The Tonight Show with Johnny Carson. On the other side of the equation was Julian Simon, whose 1981 book The Ultimate Resource decoupled population growth from resource depletion, food shortages and other barriers to progress. Desrochers recalls that after reading a magazine article profiling Simon's worldview, "I was hooked." His own research with Szurmak adds more interdisciplinary insights into Simon's discussion of creativity's role in reducing the negative impact of development. "The more people there are, the more brains there are…the more brains there are, the greater combinations of things we can create and we can come up with [as] solutions to our problems," says Desrochers. The pessimists meanwhile feel that "people show up, use resources and don't give anything back," Szurmak explains, disregarding humanity's "generative capability," and the fact that population growth will bring a more diverse knowledge base. Their book "challenges some sacred cows of the environmental movement," says Szurmak, who complains that assumptions by environmentalists are flawed, while she and Desrochers are "scrupulously honest about our data and our intellectual commitment to the truth." Their support for the burning of fossil fuels is based on their findings that "the cost of energy rationing is greater than the benefit," Desrochers says, noting that "there are no real-world alternatives" to carbon use, which is the only way to bring one billion of the world's people out of grinding poverty. He's quick to say that he and Szurmak are not pandering to big business or in the pockets of the oil companies. "We're still waiting for our cheques, which have not materialized," he quips. Szurmak, who has a graduate degree in electrical engineering, says that they are not climate skeptics or deniers but are "pro-science, pro-creativity and pro-economic development." The authors are working hard to market Population Bombed! but Desrochers says "I think it's going to be a bit of a slow burn." They hope to provoke discussion about their theory that "stopping the use of carbon fuels now is about the worst investment we can make in our future," he says. Once living standards are better in developing countries, science, technology and creativity will be harnessed to clean up the environment, Szurmak adds. "We are going to innovate out of it." Oh, so we will be extinct not by breathing CO2, but by mass starvation due to population explosion. There seem to be many factors responsible for sixth mass extinction event. More people means more brains. Well, somehow, we got now 1 billion in grave poverty (by the way, facing lifelong brain damage due to under- and malnutrition). That is unfortunately why we can no longer stop burning fossil energy. However, population size has nothing to do with us destroying the climate. Which hopeless lunatics are putting this together? So we'll all eat artificial spam and bacteria paste and be content. Yay. Is this like flying cars, food pills, and fusion? I like my artificial spam lemon flavored. Note that this does not indicate the presence of actual lemons; "lemon flavored" means about as much as "colored red with red lake #145." Kinda like watermelon candy. Paul Ehrlich warned if our population keeps growing the way it was in the 60s there would be huge famines and more extreme poverty. But everything changed, fertility rates declined dramatically, and food production doubled in the following decades. Worldwide aid organizations were created and mobilized. So of course Ehrlich's projections aren't happening the way he predicted. Now we have huge problems like water scarcity and massive numbers or refugees. Some counties are literally running out of water and the global mass extinction continues to gather momentum even if you chose to believe climate change isn't a man made problem. Economists usually say we don't need to worry about overpopulation because human innovation will solve it. Why can't we say the same about problems associated with gradual population decline? It seems to me gradual population decline is a lot more manageable than a population that keeps growing forever. Does anyone believe that is even possible? "Once living standards are better in developing countries, science, technology and creativity will be harnessed to clean up the environment, Szurmak adds. "We are going to innovate out of it."" The US "innovated out of it" by offshoring our waist and dirtiest industries to other countries. Thats right the same countries Szurmak thinks will innovate out of it in the future. A lot of Asian countries are already innovating out of it by ending the import of plastic waist from other countries like the US. Two of the primary ways developing countries increased their standard of living have been better access to education and reproductive healthcare/contraception. That right, lower fertility is actual one of the best tools we have to innovate out of it. "...Szurmak adds. "We are going to innovate out of it." ..."
So how is the development of cost-effective renewables, such as wind power for example, that replace fossil fuels, such as coal power for example, NOT an "innovate out of it"? 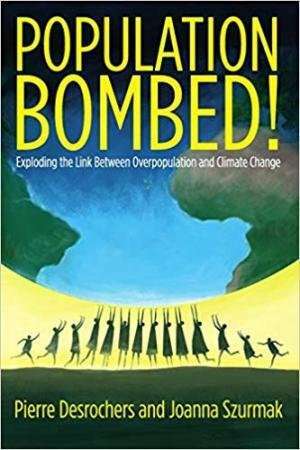 Although I would entirely agree with them that the "population bomb" is just myth (global birth rates are actually going DOWN), the rest of their message just doesn't add up And it is just all straw man: NOBODY is saying we must stop using all fossil fuels right NOW! It obviously takes TIME to switch over and in the mean time we will have to continue to use some fossil fuels. So what is their argument/point here? I don't see it. one thing seems clear----paul ehrlich's timing was obviously wrong. his predictions were specific enough that he was badly wrong. and he doesn't every explain why. the answer is by making end of world predictions, you create enough of a panic to get an audience and get paid. there is money to be made off fear mongering. There is also a lot of money in denying the scientific facts to please those people who are so emotionally WEAK as to not want to know hard reality preferring instead to put their hands over their ears shouting "LA LA LA" and bury their heads in the sand so to deny any problem exists. Stating the scientific facts that imply a potential problem isn't fear mongering. The correct response to that isn't to panic but rather use our brains to prevent it becoming a problem and nobody is implying the contrary.